Monday June 27th 1898 It was a cool pleasant day and the boys done a lot of plowing. I was busy about the work a great part of the day and practiced a little. 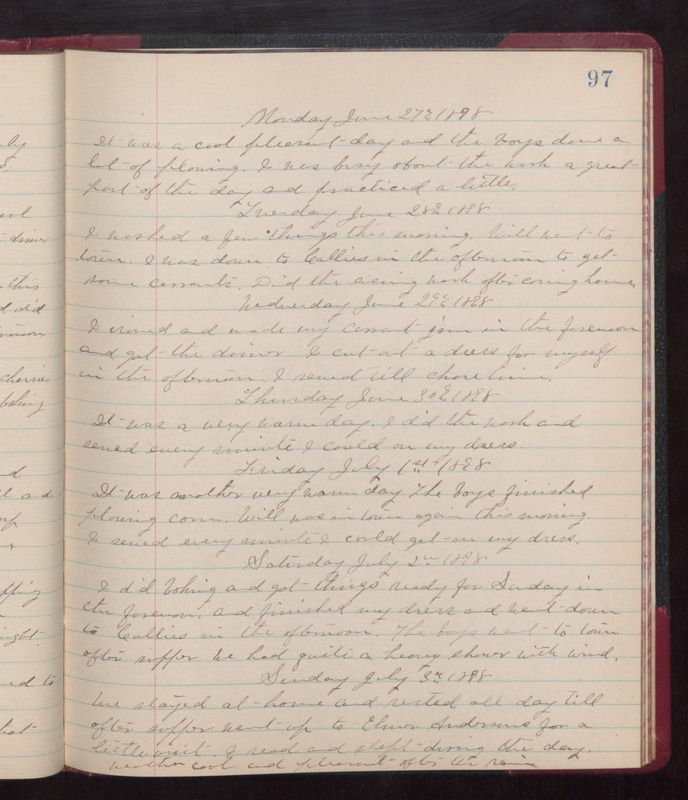 Tuesday June 28th 1898 I washed a few things this morning. Will went to town. I was down to Callies in the afternoon to get some carrots. Did the evening work after coming home. Wednesday June 29th 1898 I ironed and made my carrot juice in the forenoon and got the dinner. I cut out a dress for myself in the afternoon. I sewed till chore time. Thursday June 30th 1898 It was a another very warm day. I did the work and sewed every minutes I could on my dress. Friday July 1st 1898. It was another very warm day. The boys finished plowing corn. Will was in town again this morning. I sewed every minute I could get on my dress. Saturday July 2nd 1898 I did baking and got things ready for Sunday in the forenoon, and finished my dress and went down to Callies in the afternoon. The boys went to town after supper. We had quite a heavy shower with wind. Sunday July 3rd 1898 We stayed at home and rested all day till after supper, went up to Elmer Andersons for a little visit. I read and slept during the day. weather cool and pleasant after the rain.